The Arts Research Center at UC Berkeley is sponsoring the working session “Occupy as Form” on February 10, 2012. Participants have been invited to post some brief thoughts on the topic in advance of the event. This guest posting is by Joseph Thomas, graduate student at California College of the Arts. 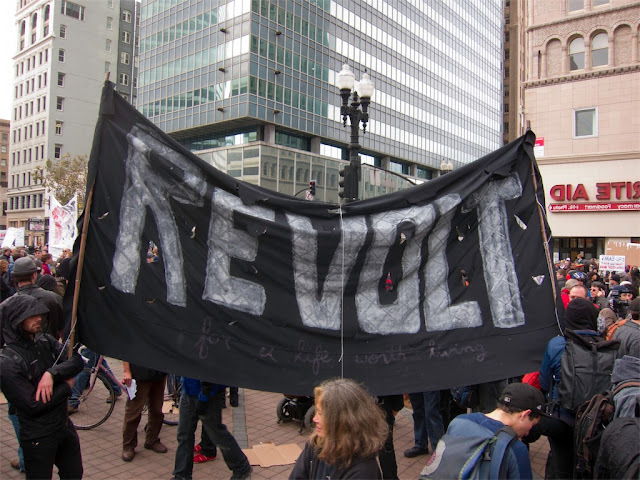 What constitutes a movement? It does not seem to be a question of scale (a large united group does not necessarily make a movement), but one of organization, or, to be more precise, a lack of organization. A movement can encompass any number of organizations, fronts, or parties, but even as it binds them together, it reaches beyond them. A movement does not call for any specific action (negotiating the question of tactics) but nevertheless has a will for action: and this will is the common ground that forms the movement.This is not to say that a movement is antithetical to organization and hierarchy: we know that organization can bring would-be-identifiers of a movement into the fold. Whether rallying behind a particular person (think of César Chávez) or against a particular opponent (1999 WTO Protests in Seattle), organization can bring many people, and a lot of force, into a movement. The power a movement has beyond organizations is its elasticity: its ability to expand to accomodate more people, more tactics, more organizations. This elasticity allows for resilience: if one portion of the movement becomes “damaged” (becomes disreputable, caught up in legal issues or other machines), the rest of it can adapt by growing somewhere else, possibly reconfiguring those who made up the defunct portion. This is why an organization must be careful not to take a movement for its own: because once a movement is contained within a solid structure, it can only grow with that structure, and when the structure is damaged, the movement suffers with it and must struggle to adapt. Here we only have to consider the reputation of Communism today: something still stuck within Cold War notions of political parties and failing states. This reputation acts as a blanket over the contemporary variety of Communist organizations, and leaves those who do not include themselves in a party or organization with the thought that they must join or create one – that Communism is a party, not an ideal (the abolition of private property) – perhaps making it more difficult to move independently. With this in mind, what are we to make of the apparent lack of organization within the Occupy movement? Is the movement elastic enough to allow other organizations to grow within it? And if so, are there any safeguards within the movement to prevent its cooptation by a specific group?